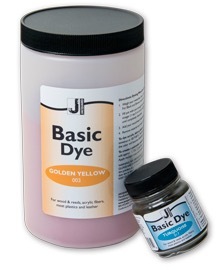 Basic Dyes are the perfect colors for hard-to-dye substrates. Developed for acrylic, these dyes are also great on wood, reeds, straw, paper, leather and hemp! Use them for potpourri, wigs, buttons…the list is endless. They are bright, beautiful and easy-to-use. In fact, basic dyes may be used to color a variety of fibers (including silk and wool), but because they tend to have poor light- and washfastness ratings, they are generally only used when other dyes (such as acid dyes or fiber reactive dyes) are not an option. Despite their poor lightfastness, however, basic dyes offer some of the most vibrant and intense colors available for any fiber, and may be used whenever maximum color intensity is desired.